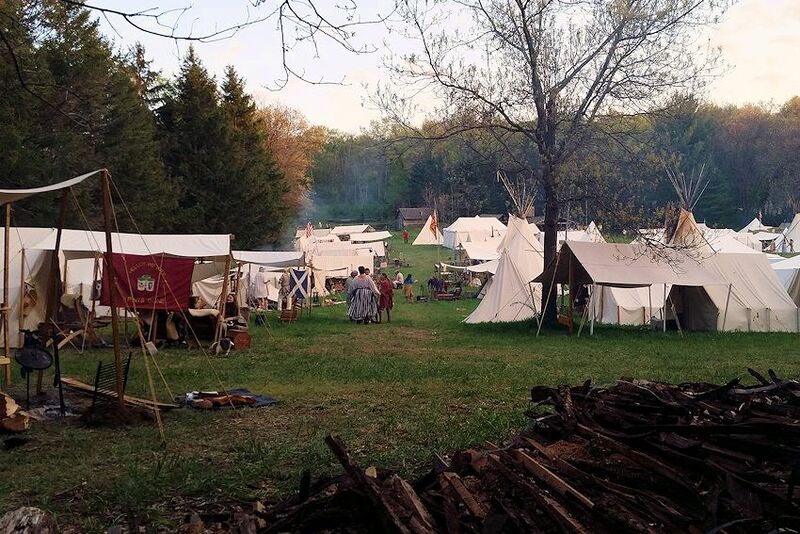 Be here for the 37th Annual Bloody Lake Rendezvous on April 30 – May 5, 2019 at the Black Hawk Memorial Parkin in Woodford, Wisconsin. Reenactors from all over the country come to participate in the many competitions and games of the springtime Bloody Lake Rendezvous. Visitors are welcome to walk through the encampment on Saturday and Sunday and ask questions of the reenactors. 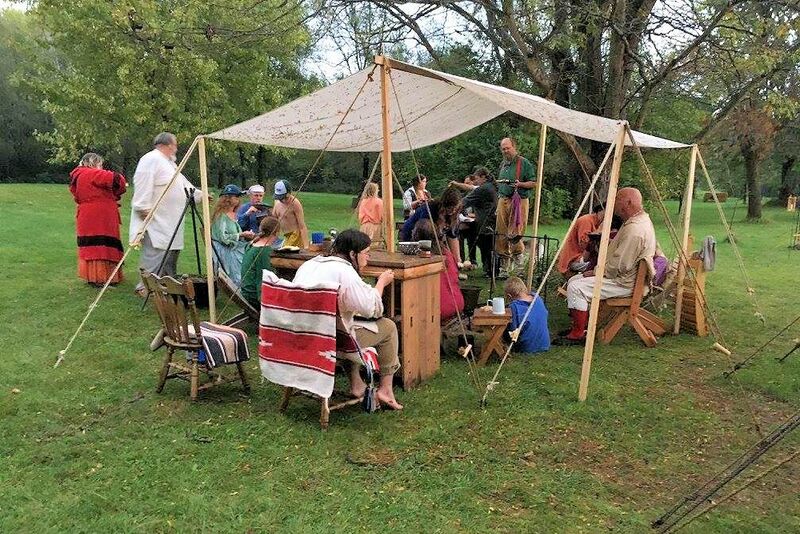 The Tuesday before the first full weekend of May, the Yellowstone Flint & Cap Club hosts The Bloody Lake Rendezvous on the back 40 of Black Hawk Memorial Park. The Yellowstone Flint & Cap Club invites Lafayette and Green County history students to spend a school day here, to witness living history and to ask questions about the lifestyles and skills of their forefathers. During the Bloody Lake Rendezvous, two of our members give narratives on the Battle of Bloody Lake, telling the historical significance of this area during The Black Hawk War. No pre-registration; first come, first serverd. The camp is closed to non-participants Tuesday – Thursday. If you would like a guest to stay, please make sure they have paid the registration fee and are properly attired. On Friday we host 6th graders from several area schools from 10:00 AM thru 2:00 PM. If you would like to participate with a 15 minute “Show & Tell” presentation, please notify the gate when you register or sign up at The Cabin. Directions: From Hwy 81: go south on M (at Jordan Center) to LEWIS Rd, which is a very short distance off Hwy 81 once you turn, and go west (right). Stay on Lewis Rd, which turns into SAND Rd & keep going forward and it will take you right to the park. From Hwy 11: turn North onto County M towards Woodford and Black Hawk Park. In about 7 miles you will come to the entrance to the park. We have use of this entire 159-acre county park, explore it. The areas north & east of our rendezvous site are private property and are off limits. Please respect the no trespassing signs. Horse Camp- Primitive gear is required. There is an area outside of main camp where you can ride your horse. See Dennis Mason for more information. Negative Coggins Test Required. Modern Camp- located in the west parking lot. Please display your registration ribbon. Handicap Parking available across from the registration tent. One (1) hour unloading time: then your vehicle must be removed from camp. Please do not block marked fire lanes. After initial set-up, please step back & look at your campsite as if you were a tourist. All modern conveniences must be hidden from view at all times. Keep your campsite clean & safe by having a properly dug fire pit and water within reach. Pre-1840 Clothing and Accouterments are required in camp at all times by participants during rendezvous. No tennis shoes, blue jeans or hiking boots will be allowed. ***Please make sure cell phones are off or silent while within public view***. No walking of dogs in camp – NO EXCEPTIONS! Dogs are to stay at your campsite with a maximum 8-foot leash tethered to your lodge. Please clean up after your pet. Amenities: Slab wood can be cut at the woodpile with your primitive saw. Carts are available to transport firewood to your camp. If you have wood left over at your camp on Sunday, please return it to the woodpile. Wisconsin DNR Restrictions: Beginning June 1, 2010 only firewood gathered or purchased from a vendor who cut it from within 25 miles of a state managed property, or state-certified wood, may be brought onto the property. This change is being done to reduce the risk of bringing in destructive forest diseases and insects. 2 state health inspected wells for potable water. Ice is available for sale at the registration tent and will be delivered, periodically, through camp by horse. Dumpster for your garbage. PLEASE RECYCLE! Mark your calendar today so you don’t forget the next Bloody Lake Rendezvous in May at the Black Hawk Memorial Parkin in Woodford, Wisconsin.